Heat shields, if they were removed, should be reinstalled. Check your pump heater and cab heater valves. 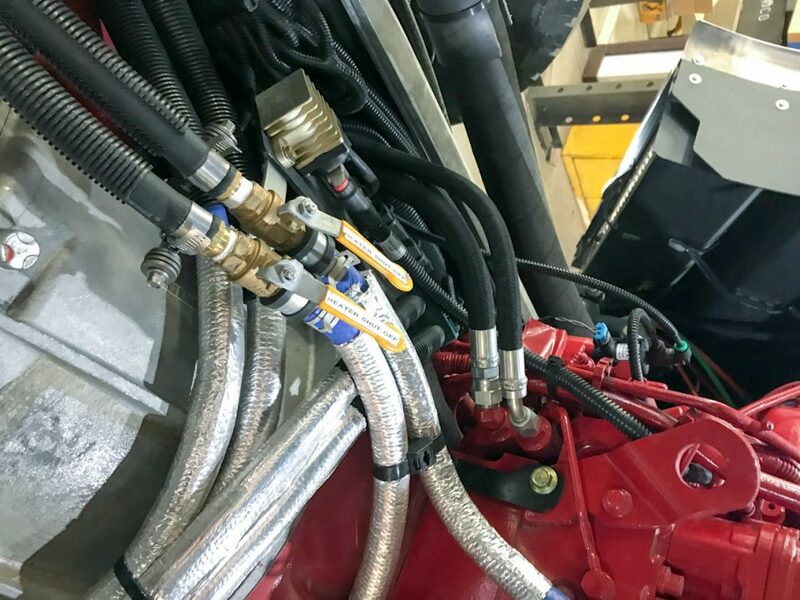 Many trucks have valves for both the pump heater and the cab coolant. If they were shut off, they need to be turned back on now. If you don’t turn them on, the heaters will not work. On custom cabs, the valves are usually behind the engine once the cab is tilted (see photo). On a commercial chassis, they are usually on the passenger side of the engine. If you run “dry pumps” during the winter, now is a great time to drain the pump and make sure there are no leaking valves. A leaking valve can cause the pump to fill and remain “wet”. If you have a leaking valve, call our service department to schedule repairs as soon as possible.